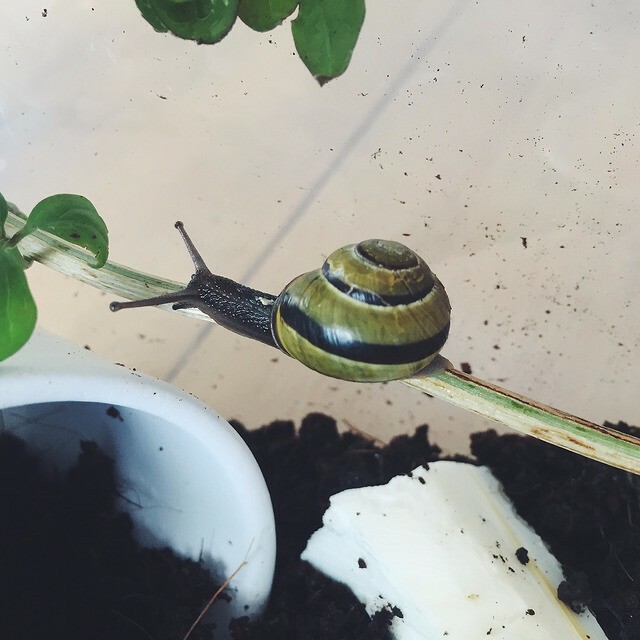 "In philosophy if you aren't moving at a snail's pace you aren't moving at all." Welcome to My Week In Words! This post covers from Sunday 24th to Saturday 30th of May! I hope you enjoy reading what I got up to this week. On Sunday I woke up to my first fry in two weeks. Gosh, it was good. I rarely go that long without one. It just felt plan wrong. After breakfast I played Sims before I had to head for a shower. Eva and I had agreed to go to my aunt Karen's house for a cup of tea rather than her coming to ours. She'd been asking us for a few weeks but something kept coming up. We brought Edwin and Berty with us as usual, so they could have fun with their canine cousins. 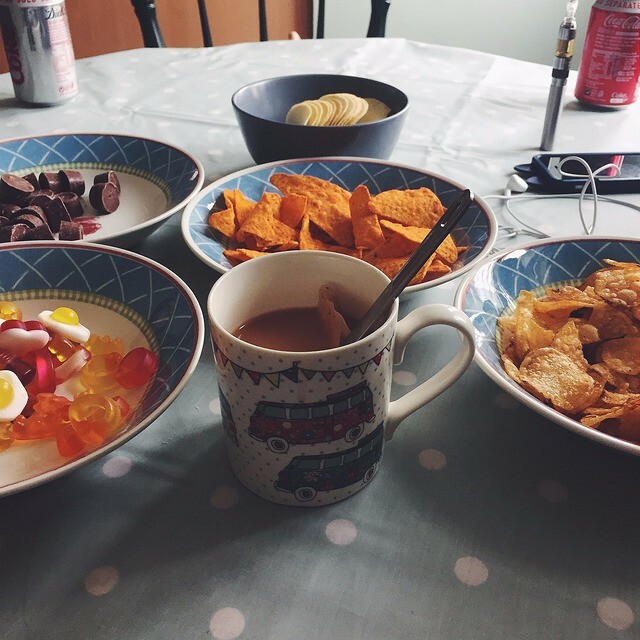 It was a nice, relaxing catch up. Aunty Karen even provided sweets! Just before we left we had the idea to see if Edwin and Berty could handle stairs. Usually aunt Karen has a baby gate on her stairs and we live in a bungalow. So neither had ever encountered stairs before. Well Berty took to them like fish to water. Scooting up and down them. He really enjoyed it. Edwin however, would not go up them at all. He watched Berty and you could see he was itching to try but he was just too scared. Eva took him to the top and he came down fine but he would just not go up them. Even when everyone was up stairs he, like me, was stuck down stairs waiting for them to come back down. When I got home I started on a belated My Week In Words, which you can read here. I took a break to make some candles with Eva from a candle we'd won at the Muscular Dystrophy Research Day. 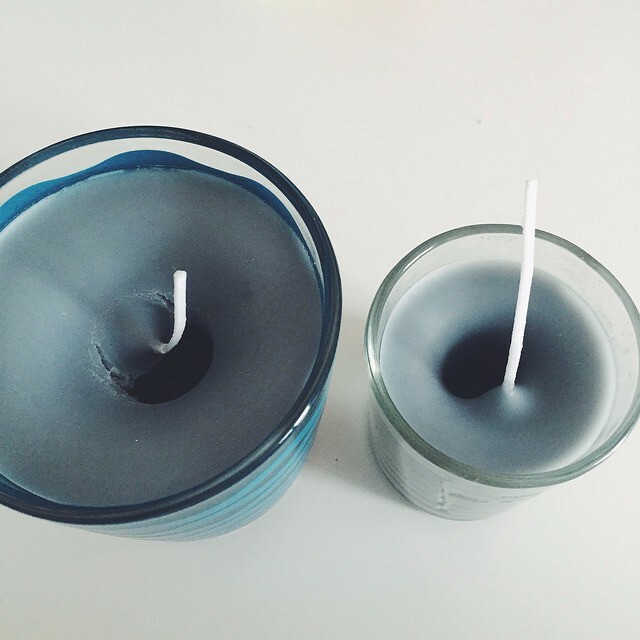 It was a big, scentless candle so we decided to make it into a few small, scented candles. It didn't exactly go to plan and the candles kind of failed. I don't know what happened, but I guess the middle bubbled and as it was drying the bubble popped and the candle caved in. I mean, it didn't stop me burning them. So it wasn't a total loss. Once we finished the candles I wrote the rest of My Week In Words, posted it and then headed to bed after supper. Eva made me a boiled egg for breakfast on Monday. As my mum was cleaning the kitchen we ate our breakfast in the living room and watched an episode of Drag Race on Netflix. I don't know why we didn't get Netflix on our big television a lot sooner! I got a headache pretty early so I decided to get into bed and read for a bit. It's the best way to handle the headaches I'm having at the moment. I got up around 5pm for dinner and felt a lot better. After dinner I made a survey to do some market research on candles for the Etsy store my sister and I are planning to make. I was so grateful that so many people give me their input and it was really helpful. It even helped us come up with a couple of ideas. In the evening I made some bracelets for the store while I relaxed watching Supernatural. I'm starting to get more into it! Eva also got me out of bed on Tuesday, but this time I woke up to croissants. We just watched stuff online while we ate. After breakfast I got to work on my Tuesday post about my recurring dreams. Which you can read here. I just got it posted when my Occupational Therapist came for a visit to measure me up for a new bath/toilet chair. Thankfully they weren't here too long. Sometimes my mum keeps visitors talking forever. I don't know where I got my lack of chatting skills from. My mum could talk for Ireland. North and South. The rest of the evening was pretty much spend relaxing. Watching Supernatural and making bracelets. My dad was off on Wednesday so I woke up to a fry. 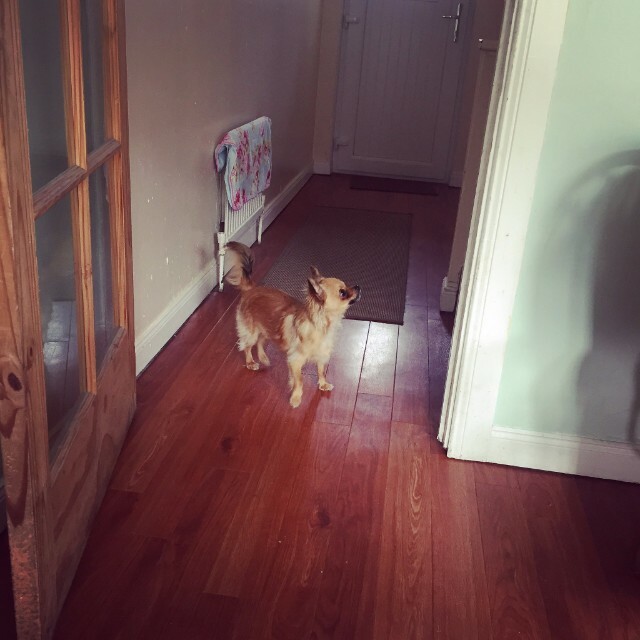 He and mum were supposed to leave early to go to Portrush for the Irish Open. My dad is a big golf fan. He'd hoped to see Rory McIlroy start, but he ended up in work to 5am so they weren't sure they were going to go at all. Eventually they decided to go anyway, despite missing Rory. So Eva and I had the day to ourselves. However, I had revision to do for my exam on Thursday morning. So I ended up alternating between revision and procrastinating. I stopped for some lunch and got Eva to watch an episode of Supernatural with me. I'm only about ten episodes into the first season so it wasn't difficult to explain to her what had happened so far. After we ate Eva helped me shower before my parents got home. In the evening I had Rue time then had an early night since I had an early start for my exam. I got up at 8am on Thursday as my exam started at 9:30am and we had to be there half an hour in advance. I'm not a morning person but I guess it meant I didn't have all day to work myself into an anxiety tornado. Dad took me to tech and I met my tutor in the foyer. She was like, "Oh Sara, I didn't get back to you about your mock but it was an A so.. that's a good way to go into an exam, right?" So that was a good set up. My assistant couldn't get the morning off so I was on my own. Well, not completely. I was in a room with one other girl and an adjudicator. The time went pretty fast but I think I did okay, but I did run out of time. I'm hoping I wrote enough and I didn't stop in a middle of a sentence or anything, which would have been a lot worse. Eva picked me up to walk home and I seen a squirrel on our way, which made me feel good. Eva and I picked up some food for breakfast on the way home as it was only around 11:30am. While I'd been away some post had arrived. Some of our candle making stuff for our store, which I haven't photographed as it isn't very interesting. 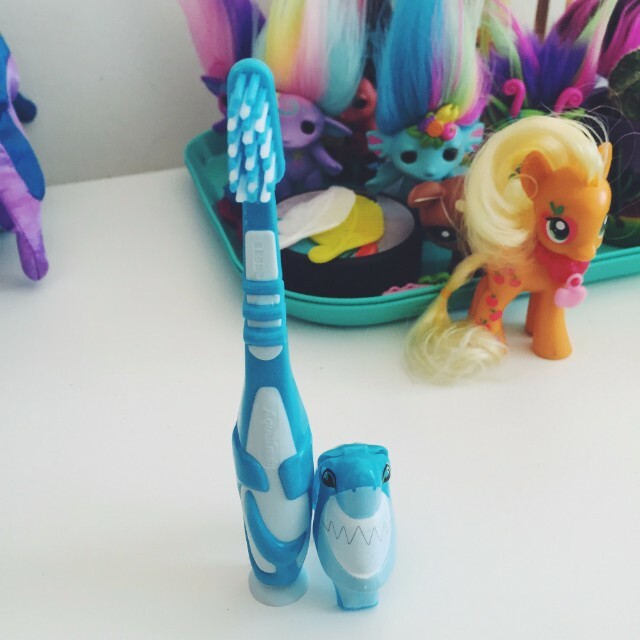 And two Wade Whimsies that I've decided to collect. 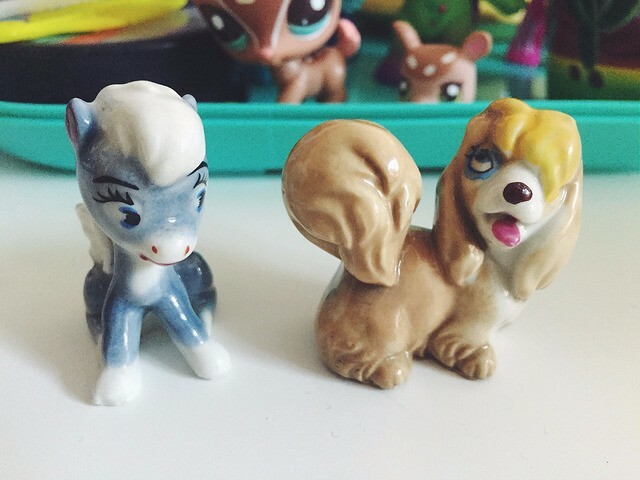 Baby Pegasus and Peg. I'm so looking forward to collecting more! After we opened our mail we decided to go back to bed to watch some YouTube videos but ended up having a nap instead. Later we got up to go shopping as Eva had to get a dress for a Gala Ball she was going to. Time for my haul! 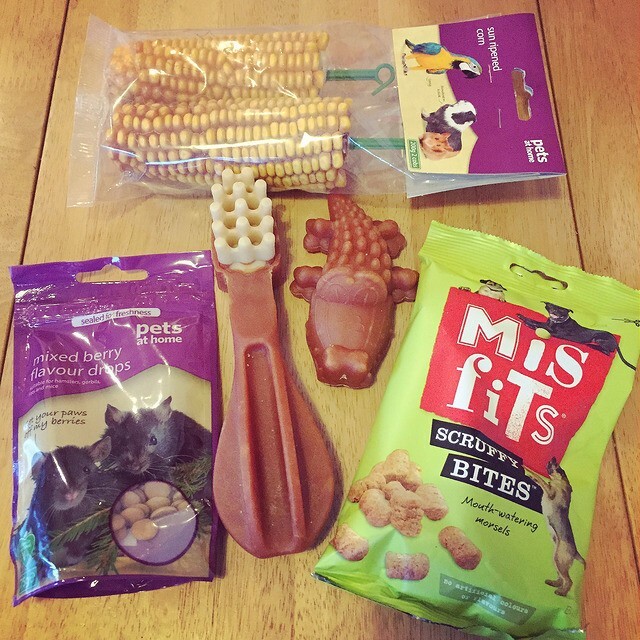 Naturally the biggest haul was from Pets At Home. I almost picked up a few articles of clothing but I put them back because I was too lazy to pay for them. 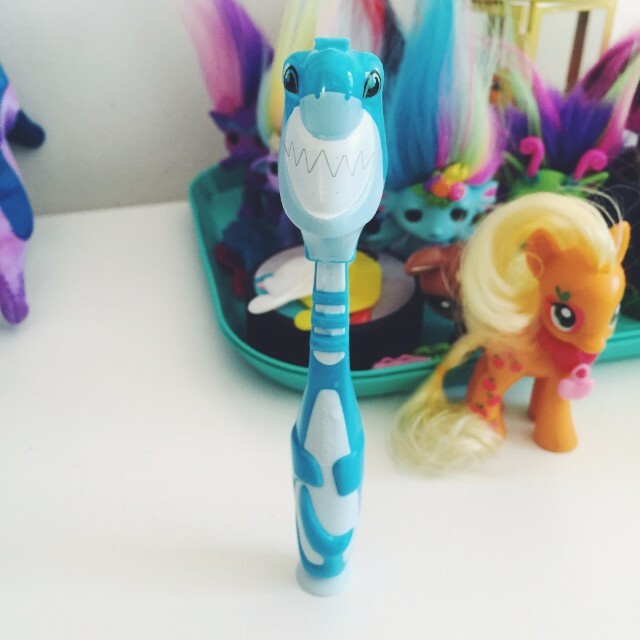 In the end I bought myself a choker, a Shopkins blind basket and lastly a toothbrush that is way cooler than yours. Eva and I were just in time to pick up a Burger King and we also got a bunch from Auntie Annie's. It was a bit of an odd night because Bloomfield had a 'Secret Sale' on. They had a DJ playing music and announcing different deals in the mall and also some guys singing. The thing about a secret sale is that not many people know about it so it wasn't that busy. By the time we got home I was shattered so I relaxed for a bit then headed to bed. Friday was a great day! I woke up to bacon for breakfast. After I tidied my room and then set about making my garden snail house! 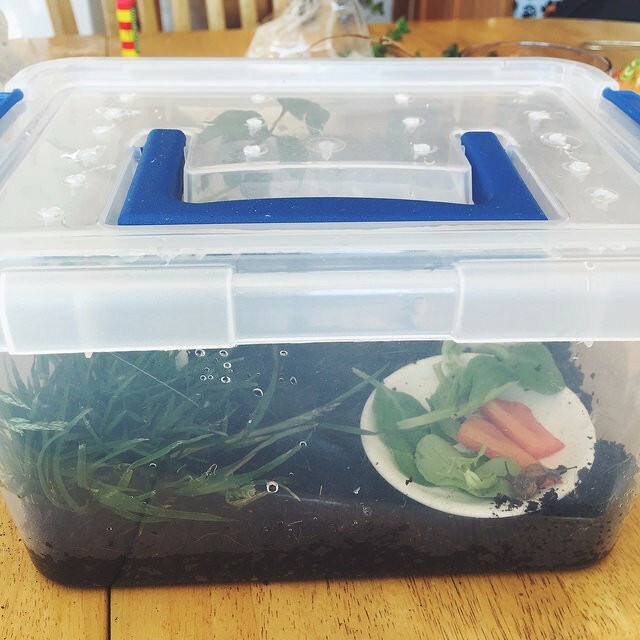 I wrote all about my foray into garden snail keeping in a blog post on Friday, making up for the post I was too busy and tired to do on Thursday. If you missed that post you can read it here. Just about the time I finished my snail house we had some post. 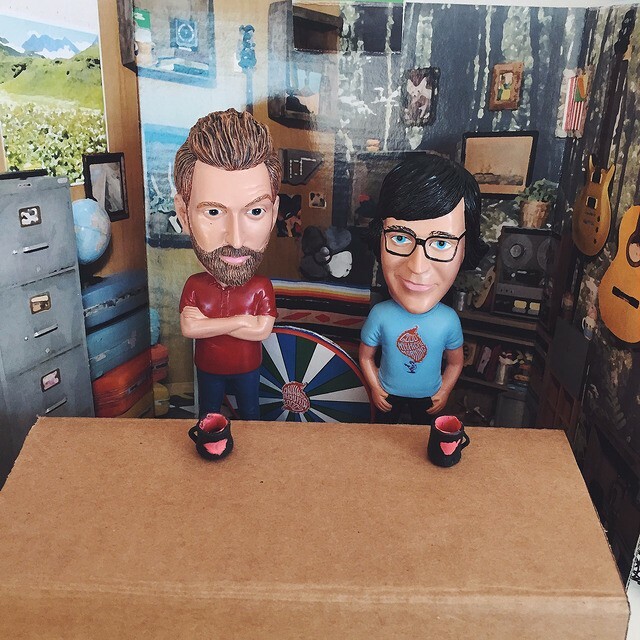 Our Good Mythical Morning bobble heads arrived! I am in love! Eva even made them a desk and some mugs. Link is mine and Rhett is Eva's. 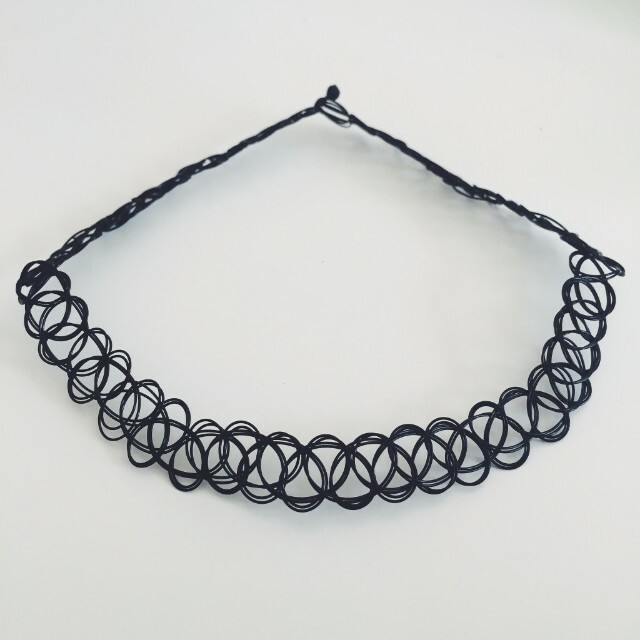 In the evening I once again made bracelets and watched Supernatural. On Saturday I woke up to a fry. Most of the day I chilled until I showered and went to visit my granny. Just before I left the house my dad brought in a big Cornu aspersum snail and asked if I wanted it for my tank. I was holding out for another grove snail and I thought this Cornu aspersum was too big for my little tank. However I figured I could give it a good feed before I sent it on it's way. I woke him up and right away he started munching on the red pepper. It was still eating when I left for my granny's. It was good to see her as it'd been a while. I was a little worried she wouldn't recognise me but she was fine. She was in a pretty good mood and we had a lot of laughs! She had me in stitches. My aunt Karen invited me to her house for a movie night. My aunt's house is just round the corner from my granny's house so my dad pushed me over. On the way he found another grove snail! Just what I wanted! It was also yellow dominant unlike like Chunk. I was super happy. He picked it up and I carried it to my aunt's house with me. She gave me something to keep the sleeping snail in until I got home. I had a great night with my aunt Karen. We talked for ages and watched Ninja Warrior UK. We had some sweets with tea and coffee and later on she toasted us some pancakes. We also watched The Amazing Spider-Man. It was a great movie, even if I didn't particularly like the character of Spider-Man. After the movie ended my aunt brought me home and it was time to let the big Cornu aspersum go. It was a rainy night and there were so many snails out and about. 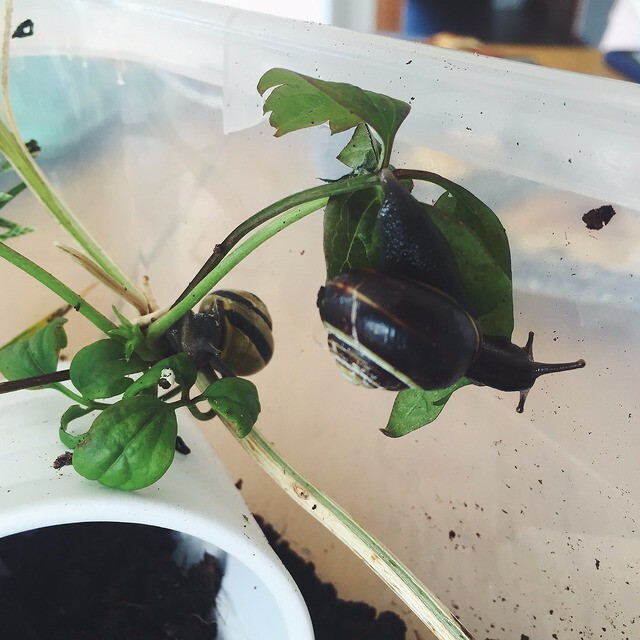 I guess you could say it was snail weather! Then I introduced my new grove snail to the tank. I think she/he is gorgeous and she seemed to fit right in. So with my little snail family complete I headed to bed and finished off my week! And there you have my week in words. It was a pretty good one. I hope everyone else had a great week too!